Today, the Maryland and Virginia State Quarter Coins remember the arbitration award on January 16, 1877 regarding the boundary between the two states. The commissioners began their task in the spring of 1872. Joint meetings were held at Annapolis, Crisfield, Baltimore and Richmond. They went to Smith’s Island and inspected the line stones at Horse Hammock. The greater part of their time, however, was given to historical research, examining maps and rummaging libraries to find evidence by which the claims of each state might be sustained. An agreement was made that the respective claims of Maryland and Virginia, as to boundary, be written out and presented in a joint meeting of the commissioners. Mr. Jones, on the part of Maryland, and former Governor Wise, in behalf of Virginia, presented claims. An attempt to reach a compromise then followed, but the Maryland members could not agree to terms of adjustment and the work of the commission ended. The commissioners followed this statement of points at issue, with an assertion of Virginia’s claim to the whole of the Potomac, and held to Point Lookout, Smith’s Island, the westernmost angle of Watkins Point, and the Calvert-Scarburgh line, as boundary marks. Both states now turned to arbitration as a means of adjustment, and, in 1874, acts were passed to that effect. The Hon. Jeremiah D. Black of Pennsylvania and Hon. Wm. A. Graham, of North Carolina, were appointed, and they selected Hon. Charles A. Jenkins of Georgia, as a third member of the Board of Arbitration. In 1876, the contending States agreed to the selection of James B. Beck of Kentucky in the place of Gov. Graham, who had died in the meantime. Each State had the right to be represented by counsel before the arbiters. Former Governor William Pinkney Whyte and I. D. Jones were counsel for Maryland, and the attorney-general of Virginia appeared on behalf of his State. The temporary line known as the “Lovett-Davidson Line” was to be observed until the award was made, and both states pledged obedience to the decision of the Board. BEGINNING at the point on the Potomac River where the line between Virginia and West Virginia strikes the said river at low water mark, and thence following the meanderings of said river by the low-water mark to Smith’s Point, at or near the mouth of the Potomac, in latitude 37° 53′ 08″ and longitude 76° 13′ 46″; thence crossing the waters of the Chesapeake bay by a line running north 65° 30′ east about nine and a half nautical miles to a point on the western shore of Smith’s Island, at the north end of Sassafras Hammock; thence across Smith’s Island to the center of Horse Hammock, on the eastern shore of Smith’s Island; thence to a point marked ‘A’ on the accompanying map, in the middle of Tangier Sound; thence by a line dividing the waters of Tangier Sound to a point where it intersects the straight line from Smith’s Point to Watkins Point. This point of intersection is marked ‘B’ on the accompanying map. In short, Virginia lost the Potomac, and to Maryland was given the south bank of that river. The part of Smith’s Island claimed by Virginia was retained by her; Tangier and Pocomoke Sounds were divided between the two states, Virginia getting the larger share; the southernmost and not the westernmost angle of Watkins Point was taken as the true Watkins Point, and Pocomoke River was divided between the states, up to where the Calvert-Scarburgh line began. This award was accepted by Virginia and Maryland, and ratified by Congress. In 1882, Mr. Wm. J. Aydelott on the part of Maryland, and Mr. G. H. Bagwell in behalf of Virginia, were appointed commissioners to survey and mark the line according to the decision of the arbitrators. Col. F. V. Abbott of the Corps of Engineers of the United States Army surveyed the line, and the work was completed in 1883. An old oak was found which had been marked by Calvert and Scarburgh in 1668, by Michler in 1859, and De La Camp in 1867, and finally by Abbott in 1883. 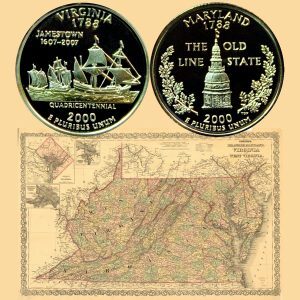 The Maryland and Virginia State Quarter Coins show with a map image of the area, circa 1886.